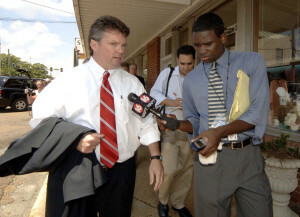 Democratic Mississippi Attorney General Jim Hood in July contacted 11 insurance companies and the attorney for State Farm to help his office with a steering investigation, the Mississippi Business Journal reported Thursday. We’re trying to get copies of one of the letters. According to the Business Journal, Hood sent them July 9 to Allstate, Progressive, USAA, Nationwide, Travelers, Safeco, Mississippi Farm Bureau, GEICO, Safeco, Direct General, Alfa and Shelter. Hood also sent one to the Butler Snow law firm, which a State Farm spokesman told the Business Journal was representing the insurer. Interestingly, some of the nation’s largest auto insurers, No. 6 Farmers and No. 9 American Family were spared Hood’s letters. (Safeco is owned by No. 7 Liberty Mutual). Hood’s office told the Business Journal it would not say how the companies responded regarding a possible meeting, just that all responded. The agency cited a desire for greater openness from insurers than would appear if the records were public. State Farm spokesman Justin Tomczak wrote to the Business Journal on Tuesday that “we immediately notified him that we would meet with him as his schedule allowed,” and the company is working on scheduling now. Hood was featured in the February “Anderson Cooper 360” report as one of two Southern attorneys general expressing concerns about insurance company practices. In the broadcast, Hood tells CNN reporter Drew Griffin that insurers pressure shops to use cheaper parts. “They use their economic power to grind down working people,” Hood says. Repairer Driven News, citing the Mississippi Business Journal’s coverage, had incorrectly indicated GEICO didn’t receive a letter from Hood in an earlier verison of this article. GEICO was contacted; the Business Journal had referred to the company by the name of its business services firm CT Corporation. Eleven insurance companies and one insurers’ attorney had been contacted by Hood; an earlier version of the article indicated 12 insurance companies had been contacted directly, as well as the attorney for a 13th.